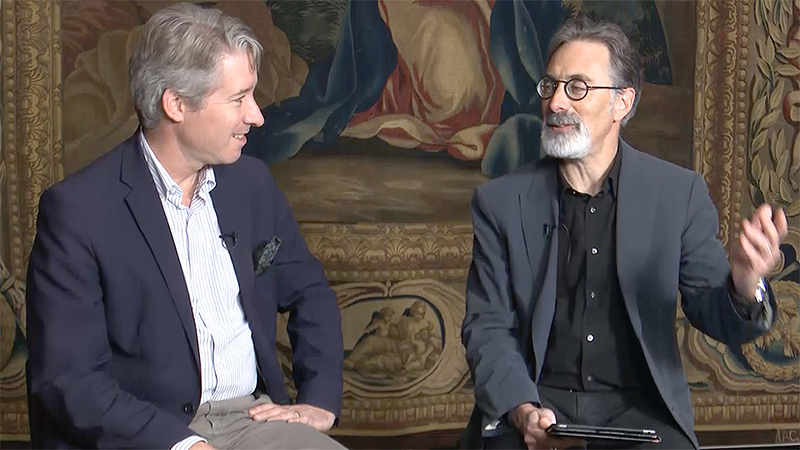 In a recent interview on “UO Today,” James Harper, an associate professor in the UO Department of the History of Art and Architecture and a specialist in 16th- and 17th-century Italian art, talked about a major exhibit of The Barberini Tapestries now on view at the UO. Harper curated “The Barberini Tapestries: Woven Monuments of Baroque Rome,” an exhibit of the ornate, 17th-century tapestries at the Jordan Schnitzer Museum of Art. The tapestries once hung in Palazzo Barberini, the family palace of the cardinal who commissioned them and were also loaned out to St. Peter’s Basilica and other locations around Rome. Harper explained that each of the 12 tapestries on display took nearly a year to produce, with six weavers working side by side and other workers spinning and dying the material. The exhibition is on view at the Schnitzer through Jan. 21. “What we’re showing in this gallery is something that is not only of great historical interest but something that is of experiential interest,” Harper said. He also talked about the rise of the Barberini family and the symbolism displayed in the tapestry series. For more, watch the interview on the UO Today channel. “UO Today” is a weekly half-hour interview program hosted by Paul Peppis, a UO English professor and director of the Oregon Humanities Center. Each episode features a conversation with UO faculty and administrators, visiting scholars, authors or artists. It is produced by the Oregon Humanities Center in collaboration with UO Libraries’ Center for Media and Educational Technology. An archive of past interviews is available on the Oregon Humanities Center’s website or on their YouTube channel.